RT type replaced by RTL. - RT type moved to Thornton Heath for tram replacement duties. Mon-Sat extended from Hackney to Leyton Green and further extended Mon-Fri peaks and Sat pm to Downsell Road. Sunday service re-introduced between Bloomsbury and Leyton Green. Saturday only Q allocation withdrawn in favour of WD. These changes were associated with Stage 2 of the trolleybus conversion. program. Saturday only Q allocation re-introduced at the expense of WD allocation. Restricted early Sunday service re-introduced between Bloomsbury and Leyton Green. Saturday service withdrawn - thus Camberwell (Q) allocation withdrawn. Partly replaced by new 253A Finsbury Park to Bloomsbury. Mon-Fri withdrawn between Hackney Station and Leyton Green although peak journeys to Downsell Road were retained. RTL replaced by RT type. Saturday service re-introduced between Bloomsbury and Hackney to replace withdrawn service 253A. Withdrawn between Bloomsbury and Leyton except for peak journeys to Shoreditch Church. Mainly replaced by new 55. Weekend and evening service also withdrawn. CT allocation withdrawn. Withdrawn between Westminster and Shoreditch via Victoria Embankment but diverted instead via Whitehall and Strand to ALDWYCH and further extended via service 68 to Euston at peak times. 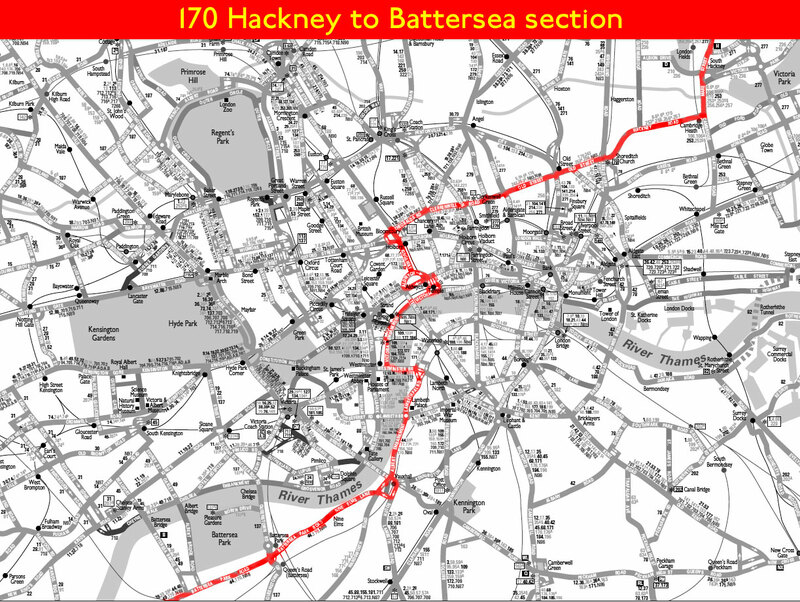 Re-routed between Wandsworth and Battersea via East Hill and Falcon Road. Extended from Wandsworth to Roehampton via withdrawn 168 to Putney Heath and then former 85A to Danebury Avenue. 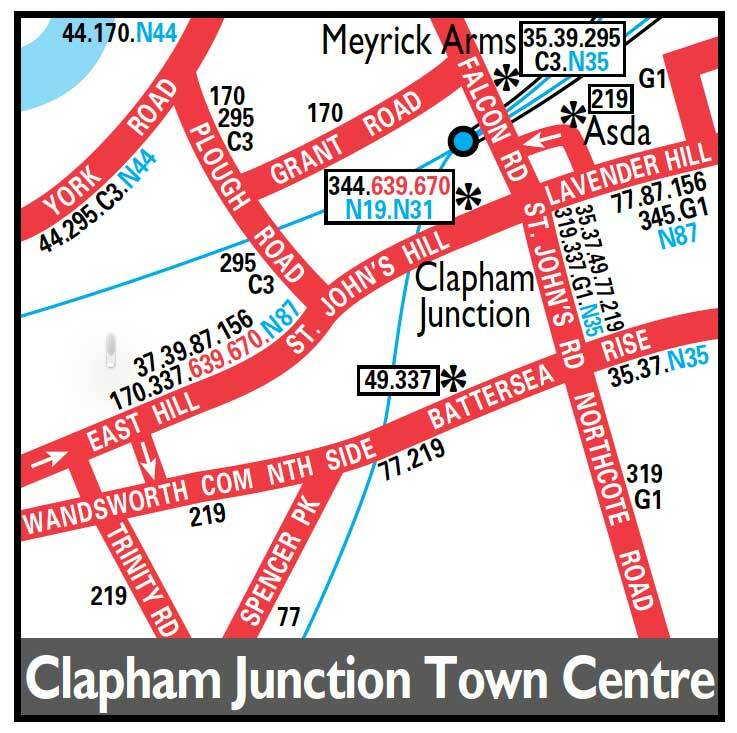 Mon-Fri evening service introduced between Roehampton and Clapham Junction and a Saturday shopping service between Roehampton and Vauxhall worked by a new Stockwell (SW) allocation. Mon-Fri peak service from Aldwych to Euston withdrawn. Mon-Fri evening service extended from Clapham Junction to Aldwych. Mon-Fri WD allocation transferred to Stockwell (SW). Mon-Fri evening service withdrawn between Vauxhall and Aldwych. Service withdrawn east of Clapham Junction. Allocation transferred from Putney (AF) to Merton (AL). Weekend Putney (AF) allocation added - and Mon-Fri Merton (AL) allocation withdrawn. New contract commenced - AF allocation transferred to SW with LDP type. Extended via withdrawn 239 from Clapham Junction to Victoria. From 02.08 VICTORIA Wilton Road stand.